Chloe the Stolen French Bulldog – Found! 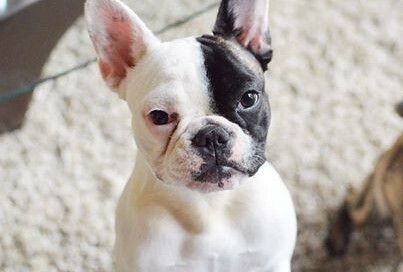 The French bulldog that was allegedly stolen from a tattoo shop in downtown Vancouver last week has been located. Chloe was allegedly stolen from the FALL Tattooing shop Thursday night by a woman who walked into the shop and asked to hold the dog. She then bolted out of the store with the dog in her hands and got into a black car with no license plate, Chloe was found wandering around a residential neighbourhood in Abbotsford yesterday afternoon. She was taken to the Fraser Valley Regional Animal Control office and positively identified as the missing bulldog. The dog is now in the process of being returned to her owner, who is elated to have her back. Chloe is believed to be in good condition. VPD spokesperson Randy Fincham says it is not clear if she got away and what happened to her in the six days she’s been missing. Fincham says the identity of the person believed to be involved was obtained by police early in the investigation, adding they have received a number of tips through social media. The subsequent police investigation revealed that Chloe’s theft possibly stems from a dispute between an employee at the tattoo shop and the dog’s original owner. Police are now trying to determine if there is a basis for criminal charges.